Part 1: Tea with Milk, Is It a Good Idea? The majority of people who like tea choose to drink it because they enjoy the taste as opposed to because of its health benefits. In fact, over two billion people around the world drink tea. Among these people, it is common to drink tea with milk as opposed to plain. While this comes down to personal preference, scientists now think that milk in tea may actually negate all of the advantages of drinking tea. Known with so many benefits, tea is good to drink. However, it turns out that drinking tea and milk together may negate the benefits to the vascular system. The health benefits associated with tea have been known for years by various cultures, such as the Indians and Chinese. Tea is packed with active ingredients which benefit our health, including vitamins and antioxidants. It can help control your blood sugar levels, improve the immune system, prevent cardiovascular disease, and reduce the damage that occurs to cells. A small study looked at 16 healthy women to see the effect that tea had on their vascular systems. It specifically looked at tea with milk, tea, and water. The study found that tea will relax your blood vessels (meaning it improves flow-mediation dilation in the body), but the effects didn't occur with milk in tea. The researchers hypothesized that the proteins found in milk known as caseins are possibly to blame. They may form complexes with the catechins in tea, which are the most important flavonoids. Interestingly enough, tea and soy-based milk has the same effect. 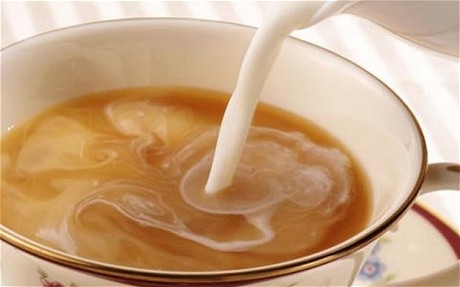 Although tea with milk will counteract some benefits of tea, there are still some people fond of the flavor. And it just give less benefits rather than side effects. Therefore, here I want to give some delicious and relatively healthy tea with milk recipes for you. Begin by putting 3 cups of water into a small saucepan, adding the vanilla bean, scrapings, ginger, cinnamon, cloves, and cardamom. Boil it on high heat before reducing heat to low. Simmer for 15 minutes until it is aromatic. Whisk in the honey and add tea bags. Turn off heat, letting steep for 3 minutes. Strain your tea into a serving pot (warmed). Heat milk in your saucepan for 3 minutes on medium-high heat. Don't let it boil. Add the milk to serving pot, stirring well. Serve right away with additional honey. Put the water (warm) in a small saucepan or milk pan, bringing it to a boil on medium-high heat. Once it starts boiling, add tea leaves, lowering the heat to simmer. Leave it 1 ½ or 2 minutes. Add your milk, slowly bringing it to a simmer. Heat up the serving cup by filling it with hot water and dumping it out. Right before the tea boils, take it off the heat. Strain it into the serving cup. Sweeten it using tea or honey. To make ice tea with milk, begin by boiling water in your tea kettle on medium or medium-high heat. An alternative would be to use an electric hot pot or small saucepan. You can also heat the water in your microwave in short intervals for your will. Place your tea bags inside a large mug then pour your boiling water on top. It is ideal to use black tea in this recipe, but you can select another strong variety, such as oolong. If you are making this iced tea with milk using black tea leaves, make a bag using a clean nylon sock or mesh tea ball and use 2 to 4 teaspoons. Let your tea steep two minutes or according to the directions on your tea brand. Don’t worry about leaving the tea exposed during steeping. Take out the tea bag and pour in your condensed milk. Stir the mixture so it is well-incorporated. Since condensed milk is sweet, no extra sweetener is needed. Put ice in a glass so it is half to three-quarters full. Pour your tea into the cup with ice and enjoy right away. Server responsed at: 04/23/2019 6:03 a.m.